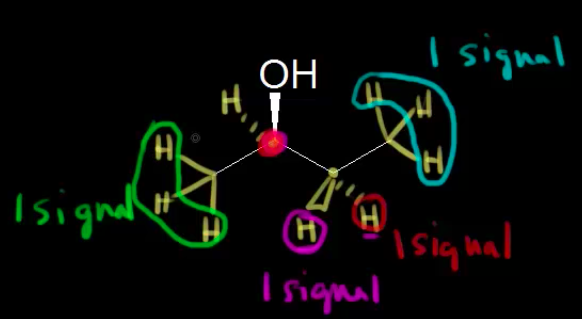 In the screenshot attached taken from Khan Academy's video (https://www.youtube.com/watch?v=p9B4s0N5yk8&list=PL0pJUwkI0YCZRYrgKqHXZ0XCIu11afbJ8&index=3) the thick pink dot refers to a chiral carbon atom. Why is it that the two hydrogens circled red and pink that are bonded to a carbon which is then bonded to a chiral carbon atom are in different hydrogen environments? However, the three green circled hydrogens that are bonded to a carbon which are then bonded to a chiral carbon atom are in the same hydrogen environment? From my understanding of hydrogen environment, a hydrogen environment is characterised by the functional group(s) that is attached to that hydrogen. Therefore, I think that the two hydrogens circled red and pink are in the same hydrogen environment, just like the three green circled hydrogens are in the same chemical environment. Therefore, my question is why does a chiral carbon atom affect the hydrogen environment of a hydrogen? And especially from Khan Academy's example, only some hydrogens are affected by the chiral carbon and some aren't affected by it. Is there some loop hole in my understanding of hydrogen environment? There is a big difference between the two hydrogens and the hydrogens in the two methyl groups. The issue is that the methyl hydrogens are part of a group that can rotate quickly and so they see an averaged environment which is the same for all the hydrogens. If the bonds were "stuck" and the methyl groups could not rotate your argument might be correct, but the is not the case. The two hydrogens on the carbon next to the chiral centre are also connected to bonds that can rotate. But they never see the same environment even on average because they will always have a different relationship to the hydrogen and hydroxyl on the next carbon. Whatever way you rotate the bond connecting their carbon, the two hydrogens will be in a different environment, so they appear with distinct shifts. Not the answer you're looking for? Browse other questions tagged organic-chemistry nmr-spectroscopy chirality or ask your own question. Are the hydrogen atoms of 2-methylindane homotopic, enantiotopic, diastereotopic or unrelated? How does hybridisation affect an otherwise chiral centre?